technique, to create the iconography of a personal trip into memory. Each participant will work on a story from life experience, personal or perceived, and will bring a little text about it. The story can be of any kind, from a simple tale about making the coffee in the morning, to an event of epic proportions: be free, the path has many possibilities. The stories will be divided into scenes according to the technique of illustration and theatre plays, experiencing new fields and new possibilities. The aim is to move the emotions of a private experience in to a “universal” one. During the workshop, each participant will be given the skill to realise colour woodcuts, from drawing to print, to be used as a poster telling the story or become the pages of an illustrated book. We will experiment and play a lot with images and, almost daily, there are plans to go on excursions to take pictures that will be used for the works: from the castle of Montefiore to the harbour in Cattolica at sunrise, from a village festival to the countryside market. Anything along a creative path that goes from photo-reportage to woodcut. 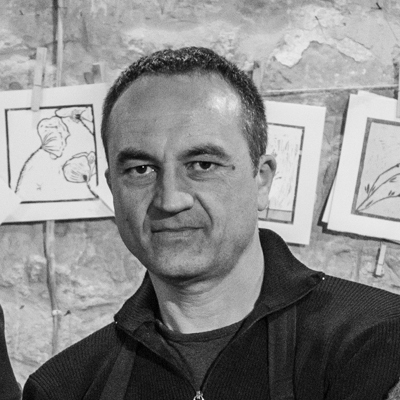 Umberto Giovannini is a multidisciplinary artist with a specific interest in printmaking. He has a passion for woodcut, for which he has developed some personal intaglio and printing techniques. Founder member of VACA, he is the director of the Opificio della Rosa a low environmental impact graphic centre. His practice is complemented with teaching on BA courses in Graphic Design and Printmaking since 1991. At the moment is Associated Lecturer in Graphic and Communication Design at Central Saint Martins, University of the Arts London and Visiting Professor at Rome Academy of Fine Arts. Course scheduled for a maximum of 12 students (for the first 5 students accommodation is included). Something to take photographs: the phone is fine.